The One People’s Public Trust represents a massive paradigm shift. It provides a structural change that will enable a long-overdue energetic change. The OPPT ratifies our freedom as Beings of the Creator in perpetuity. It corrects by law the imbalances of poverty, inequity and unsustainability. It provides a platform through which we can all experience the wonders and resources of our planet. And by removing the façade of corporate entities and the ridiculous protocols that protected its perpetrators, we will energetically reconnect with each other. As Beings. In full liability. Each with equity. As we are. Free. We are in a period of massive social, political and spiritual transformation. Personally, this transition feels a little like we are between worlds. The systemic framework that controlled our lives for so long has been removed, but the change hasn’t yet manifested in full in the physical world around us. The process of reforming former corporations into worldwide co-operatives will no doubt take time, but we already have the lawful power to reject the old system. And yet it hasn’t stopped pretending to be real. We have so many decisions to make too! What will we choose to BE and DO in the new world? What opportunities will we create with the CVACs framework? And realistically, what will we do with the “Powers That Were”? For now, it is the duty of every human Being to manifest the freedom of the One People’s Public Trust in our daily lives, and to help others to understand and integrate and manifest it in their lives too. Freedom is not free. It comes with responsibility. Do the right thing now. One People’s Public Trust Lawfully Forecloses Corporations, Banks and Governments for Operating Slavery and Private Money Systems | Wake Up World. This entry was posted in BEing, Money and Finance, News, Planetary Liberation, The Future and tagged Freedom, OPPT, UCC on February 17, 2013 by FreeSpiritPioneer. The Dark Forces are in Retreat. During the past two weeks we’ve heard of the abdication of Queen Beatrix of the Netherlands and now the resignation of the Pope. Could this be the beginning of the end of the elitist rule over humanity? Could this be the beginning of our true freedom? What could be behind this happening now? Let’s not overlook the The International Tribunal into Crimes of Church and State! The International Common Law Court of Justice (ICLCJ) commenced a case on November 6, 2012 against Canada and its churches for crimes against humanity in the Indian residential school system. Thirty two defendants, including Pope Benedict and the Vatican, the Crown and Queen of England, the Prime Minister of Canada and fiduciary officers of the Catholic, Anglican and United churches face charges of causing the deaths of more than 50,000 aboriginal children. Are the Royals and Rothschilds running for cover? Read more…………..
“The Pope’s leadership of 1.2 billion Catholics has been beset by child sexual abuse crises that tarnished the Church, one address in which he upset Muslims and a scandal over the leaking of his private papers by his personal butler.” Read more here……………. Additionally, Italy’s central bank blocked credit card payments in the Vatican last month due to the failure of the Vatican to comply with EU safeguards against money laundering. Read more here…………..
….and this is not the first time in recent months that there have been questions about the Vatican accounts. Read more here……….. 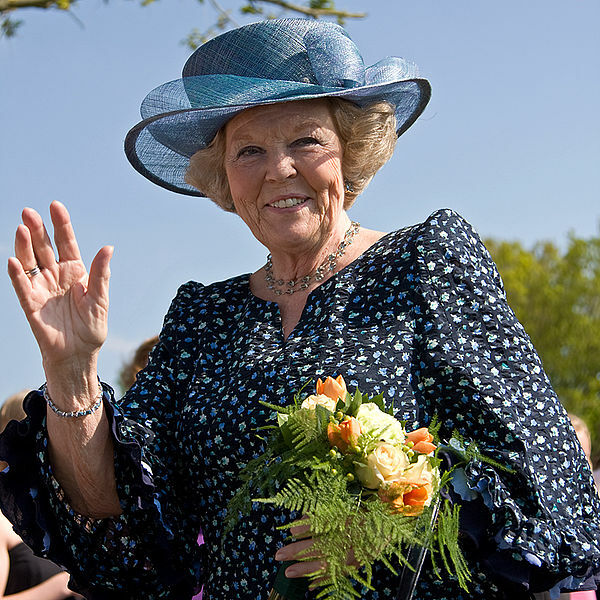 According to Wikipedia, “Queen Beatrix is a member of the Bilderberg Group and an honorary member of the Club of Rome.” Her late husband, Claus von Amsberg served in the Hitler Youth and the Wehrmacht. There were massive protests on the occasion of their wedding in 1966. How deep do the Nazi connections run in this family? Read more here………………. This entry was posted in Activism, Money and Finance, Planetary Liberation, The Future and tagged Freedom, Planetary Liberation, Pope Benedict, Queen Beatrix on February 11, 2013 by FreeSpiritPioneer. 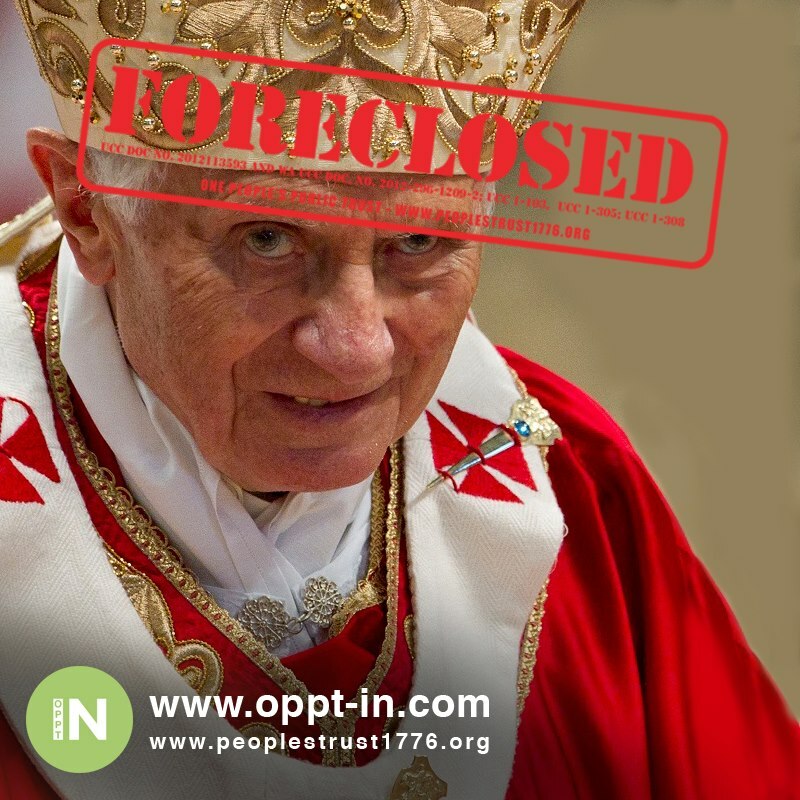 The One Peoples Public Trust has foreclosed on a long list of corporations/countries on behalf of humanity. You ARE FREE! Please read the Press Release and send it to your local media. This entry was posted in Activism, Awakening, BEing, Light Workers, Money and Finance, Planetary Liberation, The Future and tagged Freedom, Media, OPPT, Press, Social Media on February 10, 2013 by FreeSpiritPioneer. Tapping works on so many things because it’s been scientifically proven to re-wire the brain. So what does Tapping work on? Well that list is extremely long but here are some of the things that it’s been shown to help with: attracting more money into your life, providing relief from chronic pain, eliminating emotional problems, disorders, addictions, phobias, post traumatic stress disorder, and physical diseases as well as helping people clear the limiting beliefs that are holding them back from attracting what they want. Read more……………. This entry was posted in Abundance, Affirmations, Health and Wellness, Money and Finance, Visualization and tagged EFT, FREE, Tapping, videos on February 2, 2013 by FreeSpiritPioneer. This entry was posted in Affirmations, BEing, Health and Wellness, Meditation, Money and Finance and tagged BE, Being Authentic, Consciousness, Higher Self, Self, Self Awareness, Sue Harper Todd on January 31, 2013 by FreeSpiritPioneer. “So let’s imagine… you are all alone on an island. There is no one you have to please, no one to see what you look like, no one to compete with and no one to judge you. You can eat what you like. You can be how you want to be. Here there really is nothing to do except be you. This entry was posted in Abundance, Affirmations, Awakening, BEing, Health and Wellness, Money and Finance, The Future, Visualization and tagged Be Free, Being Free, Freedom, Sue Harper Todd on January 31, 2013 by FreeSpiritPioneer. American Government and Banks joined forces to crush the Occupy movement. “The FBI’s police-state snooping and tracking of Occupy Wall Street … had begun even before most Americans knew that there was any such movement for the FBI to snoop against. In other words, the reason why Barack Obama’s “Justice” Department refuses to prosecute even a single one of the mega-bank executives who profited so enormously from having defrauded both mortgagees and the investors in mortgage-backed securities, and who were bailed out by future U.S. taxpayers whose government purchased those remaining “toxic assets” at 100 cents on the dollar, is clear: we live in a police state, and these elite crooks control it. This is not real democracy. Voters were given a choice in November between a President like that but whose liberal rhetoric is condemnatory of “Wall Street,” versus a professional stripper of corporations, whose rhetoric was overtly supportive of Wall Street. And voters chose the former. But this nonetheless is a police state, not an authentic democracy. This entry was posted in Activism, Money and Finance and tagged Activism, FBI, Occupy, USA on January 6, 2013 by FreeSpiritPioneer.